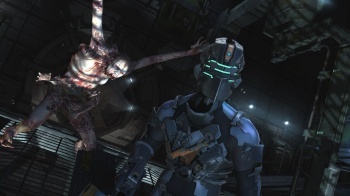 Visceral is putting together a patch so that disabled gamers can play Dead Space 2 more easily. British gamer Gareth Garratt, who has cerebral palsy and plays games using his chin, was dismayed to discover that Dead Space 2 wouldn't let him assign the walking controls to a mouse button. Frustrated, Garratt posted about his problem on the Overclockers UK forum, and thanks to the power of the internet, it ended up in front of the game's developer. Garratt first posted about his issue on January 31st, and over the course of a week, the thread swelled in size to more than 900 posts. It also helped draw more attention to an online petition set up by quadriplegic gamer Chuck Bittner in 2009, which calls for developers and publishers to make customizable controls the norm across all games. So far, Bittner's petition has gathered more than 24,000 signatures. Eight days after Garratt's original post, a developer from Visceral Games' Australian branch, which handled the PC port of the game, said that he had spoken with the studio bosses and would try to include something to help Garratt in the next patch. In a statement, Dead Space 2's executive producer, Steve Papoutsis, confirmed that Visceral was indeed working on fixing Garratt's problem. He thanked the PC gaming community for bringing the issue to the studio's attention. He said that his team was passionate about getting the fix completed as soon as possible, and once it had been finished and properly tested, Visceral would announce a release date. The update will also include a few other fixes for PC players besides the remappable controls. It's heartening to see a community rallying round to help one of their own, and it's even better when that effort results in positive change. This probably won't be the turning point in a customizable control revolution, but it's a good step towards making gaming accessible to people who have difficulties with traditional control setups.